In the morning we will select photos or sketches to work from and you will be shown examples of prints and printing plates made using the same techniques you will be using. After a demonstration you will then begin making your plate using carborundum, emulsion, cutting and tearing. Once your plate is made it will be dried and sealed. After lunch, you will be shown how to ink and wipe your plate before printing and then be able to produce your own small edition of prints. Please wear old clothes, bring an apron and any images that you may want to use; mountains, lakes, waterfalls or your garden? These can be your own photographs or sketches or can be ripped out of newspapers or magazines. Water is a huge source of inspiration and the surrounding rivers and waterfalls also provide a great source of ideas, drawings are often developed into collagraph plates and printed, sometimes including elements of the landscape in the design but always trying to convey a feeling of atmosphere rather than detail. 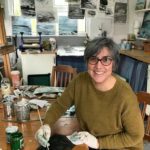 Her Fine Art degree, MA and many years teaching helped develop her paintings and printmaking, each material feeds back into the other, the layering, overprinting and intaglio techniques are present in all. Penny is secretary of both Three Peaks Arts and Cumbria Printmakers and teaches printmaking at the Brewery Arts Centre in Kendal.